I recently had to modify the Endpoint URLs on our SQL Server Availability Group replicas. Do I need to suspend data movement prior to making this change? Would this change require a restart of the database instance? I spent enough time searching on my own to no avail that I tossed the question to the #sqlhelp hashtag on Twitter and Slack but didn't get an answer prior to executing the change request. After reading the relevant documentation, I think it's probably a good idea to suspend data movement for this change. I completed this change successfully last night. I suspended data movement for each replica prior to executing their respective ALTER. I'm not sure suspending data movement was required but it didn't hurt. This change did not require a restart of the SQL instance. If you need a practical approach to managing database administrator access without always granting the sysadmin role to your database administrators then I encourage you to vote for my GroupBy session for the December lineup. As the SQL Server security model has become more granular, it is now easier to do routine database administration without sysadmin access. Starting with SQL Server 2005, administering SQL Server without sysadmin access is now possible for many of the typical DBA tasks. For example, a DBA only needs the ALTER SETTINGS permission to use the sp_configure command on a database instance. To run SELECT queries on Database Management Views requires either VIEW SERVER STATE or VIEW DATABASE STATE depending on the DMV being queried. To use Query Store requires only VIEW DATABASE STATE. CONTROL SERVER can be granted to DBAs that allows them to do almost all the tasks that sysadmin allows but unlike the sysadmin role, it can be DENYED access to data that the business considers sensitive. This session will review a proven process for managing database administrators permissions without giving uncontrolled sysadmin access. If you want more practical advice on how to manage database administrator access, vote for this session. 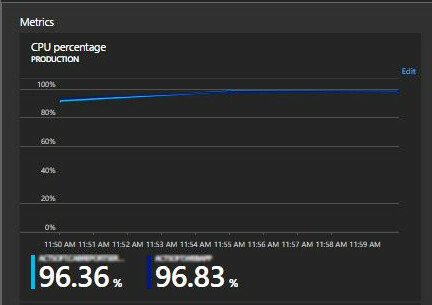 Azure Portal CPU Graph Bug or Feature? I support an Azure PaaS application. We had a brief outage recently. 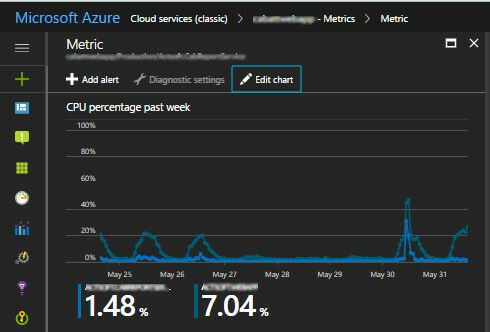 Given that the code had not been changed in a month, we suspected some maintenance in an Azure data center stepped on our application. Ping tests and self-tests failed for approximately 10 minutes. The outage resolved on its own without intervention. 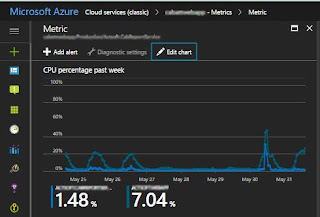 I submitted a ticket to Azure Support to determine the cause of the outage but the reason I'm writing this post is because of the behavior I observed with the CPU graphs for Cloud Services while investigating the outage. The CPU graphs show different results depending on the time range selected. I would expect to see the CPU spike with the same value no matter what time range I selected. But, to see the spike that fired the alert, I had to to "Edit" the chart and select different time ranges to see the differences. It wasn't until I selected a narrow custom time range that the CPU graph would display the CPU spike that corresponded to the alert firing. The alert fires if the CPU percentage exceeds 80% over 15 minutes. So, if you "know" something happened, try different time ranges but especially the custom range to find what you are looking for. This behavior has been documented and forwarded to the Azure portal team for review. It appears in both the Classic and current Azure portal. The response from Azure Support when I raised this concern. "I have had discussion with our Azure UI team and Azure Monitoring team regarding the portal graph. As they mentioned, When we look at the 24 hours of data in the portal, the data is aggregated at 1 hour granularity and the average is shown. Similar is the case for 1 week of data shown on the portal. Since the spike exist for 5 to 10 minutes, we need to see the custom data option instead of using the 24 hour and 1 week. These 24 hours/ 1 week graph will be helpful when you have spike for more than an hour." Having moved from a Fortune 50 company using BMC Patrol for SQL Server Monitoring to a small software company of less than 200 people, I'm rediscovering SQL Server Agent Alerts. Why might you ask? Because small companies can't afford expensive tools and need to use the out-of-the-box features as much as possible. This past week, I rediscovered that you can alert on SQL Server performance conditions using SQL Server Agent. I needed to alert on database transaction log usage. How to create SQL Server Agent alerts can be found at the link below. Under Options, I suggest you set a delay of 10 minutes. Unless you like to be spammed every minute when bad things happen. I'm hoping it will provide enough notice to prevent an undesirable event from complicating my life.